This year one of my goals is to read at least 25 books, and it’s the first time I have a reading plan. Last year I just did what I always do, I chose books at random based on suggestions and advertisements. Inspired by Why You Need a Reading Plan on the Art of Manliness blog, my plan for this year contains such titles as Team of Rivals, 12 Rules for Life, and Valley Forge. It feels good to have a plan. 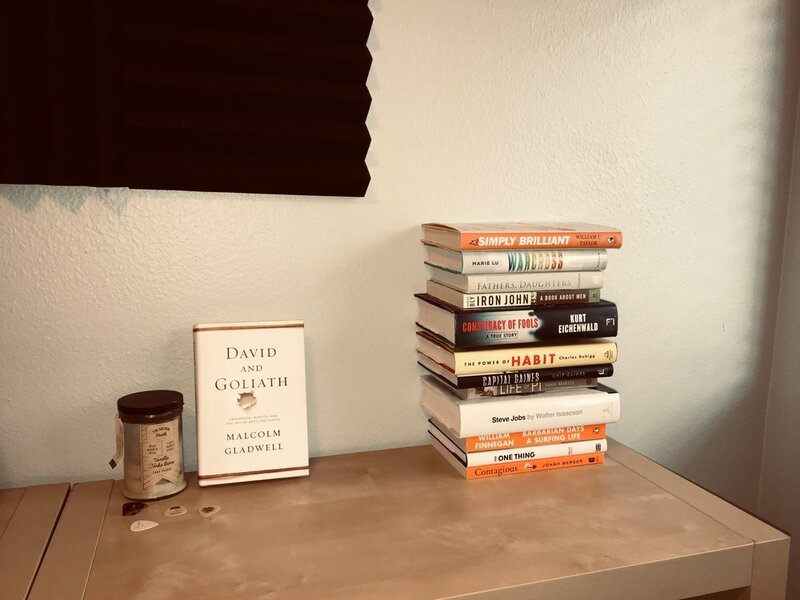 I just finished the first book in my plan, David and Goliath by Malcolm Gladwell. In the book, Gladwell explores how perceived disadvantages and negative traits often challenge us or give us the right attitude required to achieve greatness. One of my favorite parts of the book is in chapter 4, where Gladwell examines how dyslexia can lead driven people to enhance other abilities in pursuit of success. For instance, while dyslexia greatly affects a person’s reading ability, it does not stop them from becoming an excellent listener. This is the case for David Boies, one of the most famous trial lawyers in the world. For the record, I do not have dyslexia. But I greatly enjoyed Gladwell’s examples. He takes one generally accepted notion, that dyslexia is a disadvantage, and points out how it can potentially be very powerful in an alternative, positive way, albeit in a small subset of people who have the nerve to defy it’s negative effects on one aspect of their life. I asked all my friends this question and the first answers are almost always 10 cents, which is wrong, and perfectly illustrates the function of the test. Invented by Yale professor Shane Frederick, the test “measures your ability to understand when something is more complex than it appears - to move past impulsive answers to deeper, analytical judgments.” The questions seem simple, and they are, but not in the way they first appear. Frederick gave the CRT to students at nine American universities. The scores were predictable based on traditional IQ tests. But a couple of psychologists named Adam Alter and Daniel Oppenheimer also gave the test to some students at Princeton. Except this time, they made the text very hard to read. They made it more difficult on purpose. The result? The average score increased by 29%. According to Alter, the change in readability caused students to slow down, think more deeply, and use more resources to come up with an answer. It illustrates the concept of “desirable difficulties” perfectly. This is from a very short passage in the book. I recommend you check it out. There may be some things you need to look at a little more closely, or a in a completely different way.